I am a "wanna be" minimalist. Or it's possible that minimalism is something you have to grow into and I just haven't yet fully done so. The kind of minimalism I am referring to is the practice of clearing out the excesses in one's life and learning to live with less. According to self proclaimed minimalists Joshua Field Millburn and Ryan Nicodemus, "Minimalism is a tool that can assist you in finding freedom. Freedom from fear. Freedom from worry. Freedom from overwhelm. Freedom from guilt. Freedom from depression. Freedom from the trappings of the consumer culture we’ve built our lives around. Real freedom." These two men have spent the past few years traveling the country sharing the impact minimalism has had on their lives. They even made a documentary about it titled appropriately, "Minimalism." While learning to live with less is not always a choice, since many people don't have the luxury of having more than what they need or want, it does seem to be an idea on many people's minds. There are countless shows on cable tv about tiny houses - "Tiny House Nation," "Tiny House Big Living," "Tiny House Hunting" - just to name a few. There are also plenty of books about de-cluttering your life. "The Life Changing Magic of Tidying Up,"Unstuffed," "Spark Joy," and "Decluttering" are a few. 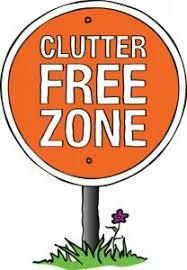 Decluttering and minimalism do seem to go together, however, since if you are going to become a minimalist, it means you will first need to get rid of the excess clutter in your life. So, as I think about the statistical reality that there are fewer years ahead of me than behind me, it seems like a good time to scale things back. One benefit of having lived on our sailboat part-time is that it made me aware of all of the things I didn't need. I actually found myself feeling freer when we were on the boat. There was less stuff to take care of and less stuff to have to buy (where would I put it? ), which ended up making me feel a bit less encumbered. But I also think there are lots of reasons why people might reach a point in their lives where they want to start shedding things instead of acquiring new ones. And - spoiler alert - we are all going to die and someone will have to deal with all that stuff we have accumulated. But how does one go about doing that (the getting rid of the accumulation part - not the dying part)? I know some people who have actually held estate sales - something that has traditionally been done "after" you die, in an effort to scale down. Since I'm not sure my stuff is really "estate" worthy, we did recently have a garage sale to begin the process of "decluttering." I discovered that I didn't need that extra toaster oven, or the "rustic" table that my cat had used as a scratching post so long that the legs looked like they were permanently indented. 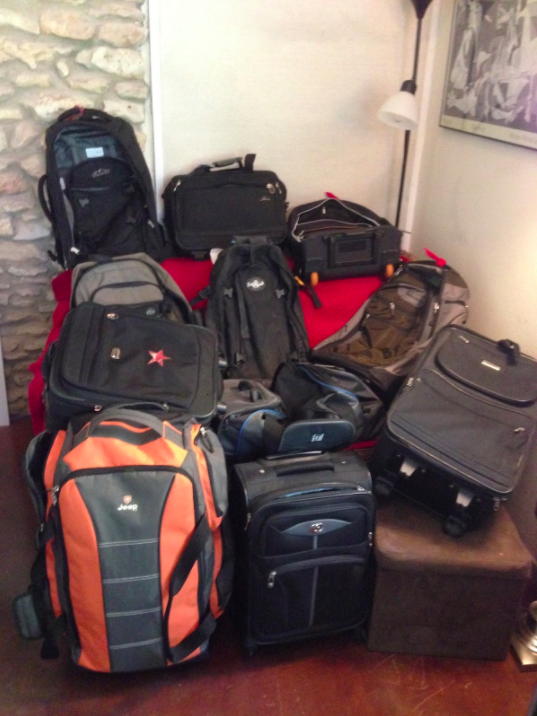 And some people know that I tend to accumulate luggage, since one of my blog posts confessed to this particular obsession. 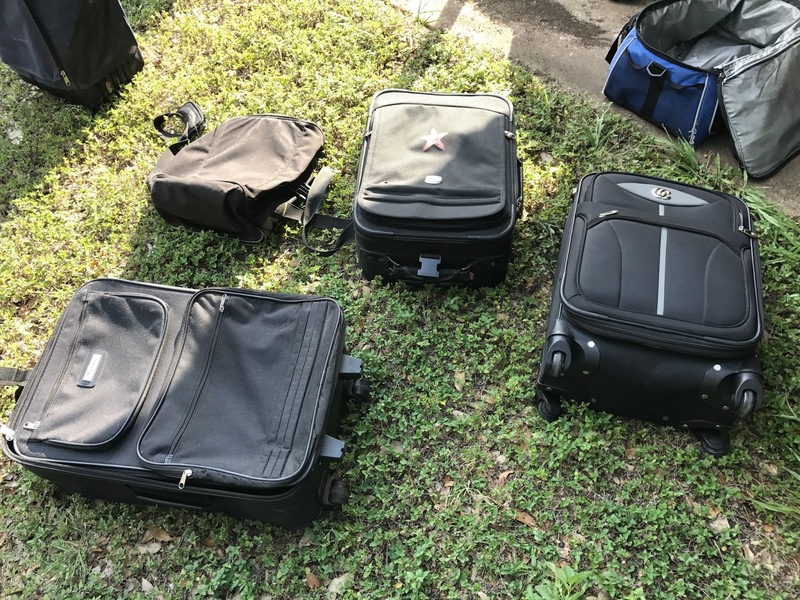 I am happy to report that because of the garage sale, I am now down from around a dozen pieces of luggage to 5. At the end of the day, however, I came to two realizations. The first was that I never wanted to have another garage sale. The second was that I really didn't need all that stuff. And the bonus part was that letting go of it felt really, really good. If you need a motivator to help you scale down, I suggest going to an estate sale, preferably one of the kinds that occurs after someone has died. Going into someone's home that the kids have obviously opened up after Mom and Dad died, and seeing all their stuff on display for a dollar or two is just about the most depressing sight you can imagine. I don't want my kids to have to decide whether something I had saved for 40 years should go in the trash, in their garage, or to a stranger at a garage sale. Another way to begin to let go of things, of course, is to move. There is nothing like making a geographic shift to help you reassess which things to keep and which it is time to let go of. You don't even have to really move, just think about what you would leave behind if you did. Doing that also forces us to think about what has value for us. Do I part with that ugly lamp and keep that painting that gives me a sense of calm every time I pass by it? Part of my own motivation to become a "minimalist" or at least to declutter my life, is associated with the possibility of a geographic shift. As my husband and I consider making Rockport our full time home, it's hard not to look around at all of our stuff in Austin and begin to question its value to us. So, I will continue to try and grow into my minimalist aspirations. I momentarily imagined it had already happened while sitting in my living room watching a documentary on TV about minimalism. I suddenly saw my backyard flash across the screen, with someone sitting on my bench talking about being a minimalist. It turned out, however, that it wasn't an alternate universe I was watching. Apparently a guest in our vacation rental attached to our Austin house was being interviewed for the program, and decided our yard made the perfect backdrop. 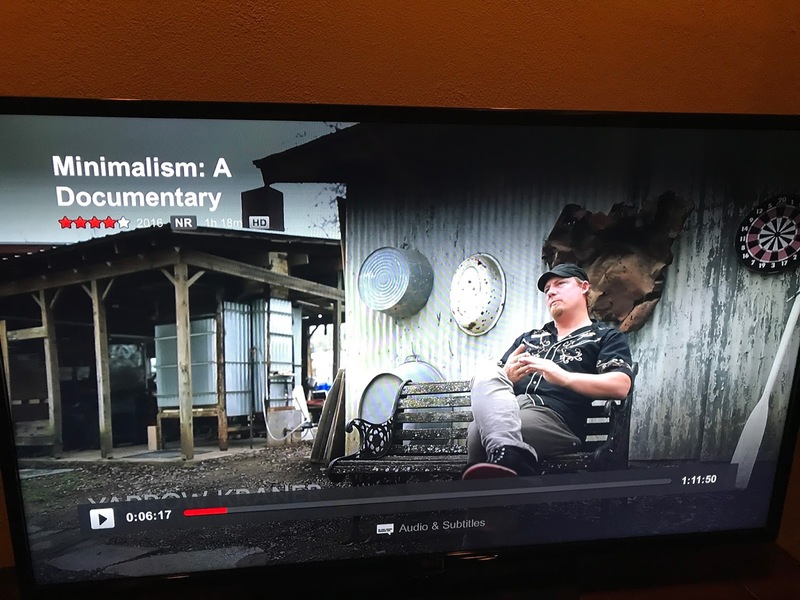 While watching a documentary about Minimalism on TV, I suddenly saw my backyard flash on the screen with someone who I had never met, being interviewed about minimalism. While having a minimalist interviewed in my yard did not get me any closer to actually being a minimalist, watching the interview did motivate me to at least declutter that part of my yard. You have to start somewhere, after all.